I know overnight oats have been floating around the interwebs for a while now, but I just recently discovered them on Vegukate.com and I am absolutely hooked! They're so, so easy to make, and super healthy. They don't require much (if any) added sugar, and they're really versatile. Normally I just soak 1/2 cup oats and 1 tablespoons chia seeds in about 3/4 almond milk overnight, and then in the morning add fresh fruit, toasted nuts, and cinnamon or vanilla. However, this recipe is really a special treat! 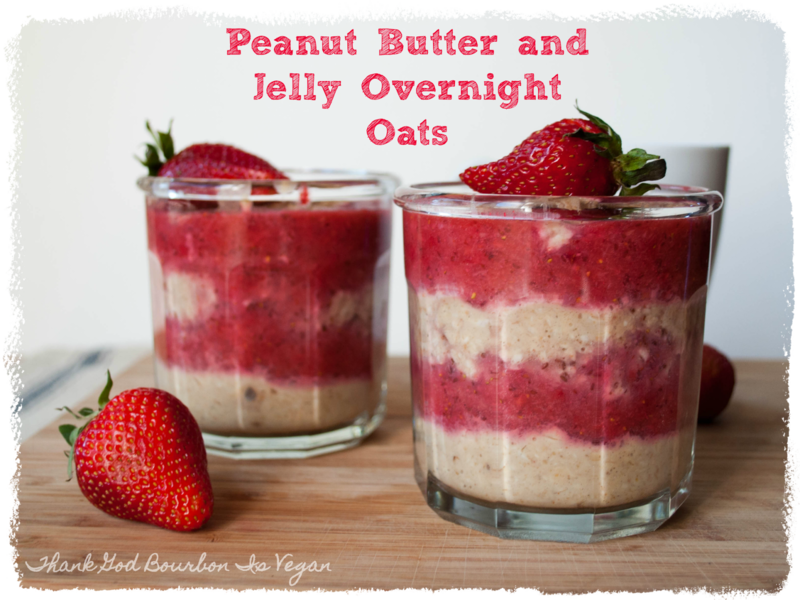 It's layers of strawberry "jelly" and creamy peanut butter and banana oats. When you wake up and remember you have this breakfast waiting for you in the fridge, you'll have no trouble at all getting out of bed! By the way, it actually doesn't actually have jelly in it. 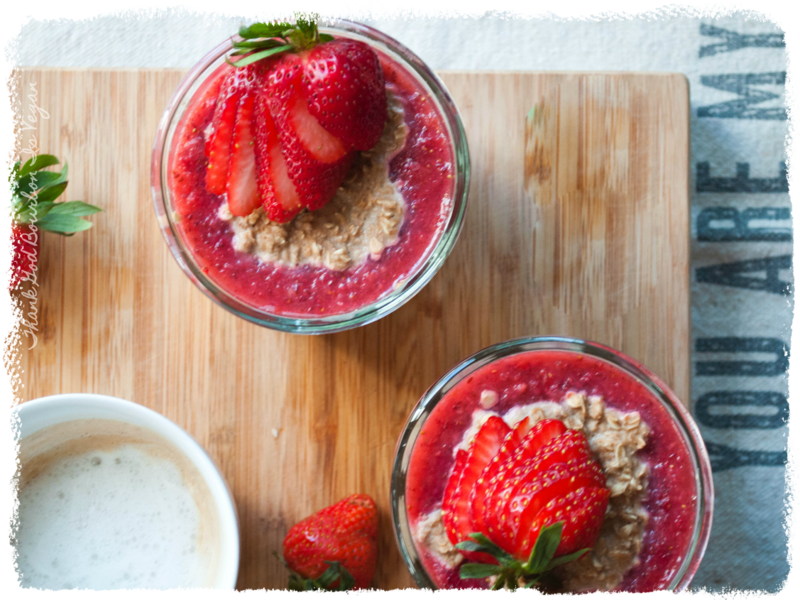 What it does have is pureed strawberries with a touch of agave and lemon juice, and chia seeds to help give the strawberries a jelly-like texture. In a blender, combine the nondairy milk, banana, and peanut butter and blend on high until combined. Place the oats in a medium bowl, and add the banana mixture. Stir until the oats are evenly distributed. Returning to the blender, add the strawberries, agave, chia seeds, and lemon juice. Blend on high until combined. In two bowls or glasses, add about a quarter of the oat mixture to each. Layer about a quarter of the strawberry mixture over the oats. 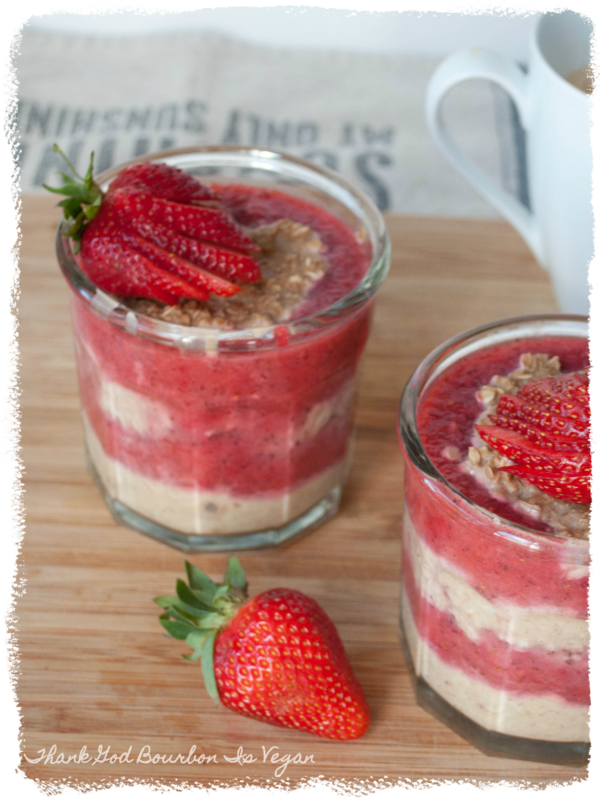 Split the remaining oat mixture between the two glasses, and follow with another layer of strawberries. Place in fridge and let sit overnight. When you wake up, enjoy!